"Optimism is a catastrophe waiting to happen." In a laboratory on Manhattan's Lower East Side, engineers and scientists are designing a robot that will be unleashed to roam the labyrinths that exist beneath the streets of New York City, where explosive forces can erupt from underground at any time. If this sounds like science fiction or another installment in an anime series, it isn't. 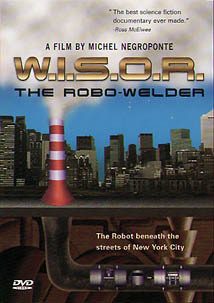 This is the basis of Michel Negroponte's development documentary on the Welding and Inspections Steam Operations Robot: W.I.S.O.R., whose mission it is to save the infrastructure buried beneath the streets of New York. In 1881 the New York Steam Corporation was formed by Charles Emery. The company's vision was to build a network of underground pipes which could feed centrally generated steam to buildings throughout Manhattan. It was a bold move, which today has evolved into over 100 miles of pipe under the city, servicing everything from the heating of the Empire State Building to laundromats and Turkish Baths�over 2000 buildings in total. As the system gets older and disintegrates, the challenge of constant maintenance is enormous, as are the costs and hazards, requiring closing off streets to excavate, and incurring tremendous cost each time there is a failure. Built over the last 100 years, much of the piping is lined with asbestos, and the explosions that have resulted from ruptures in the pipeline have sent caustic debris 15 stories high, resulting in major traffic disruptions, property damage and human fatalities. New York City's utilities supplier, Con Edison, approached Honeycomb Robotics, who have previously designed solutions for the likes of NASA, Coca Cola and IBM, to engineer a robot that could inspect and do preventative maintenance within the pipes, helping to eliminate failures before they occur. The task is monumental. Nothing like this has ever been built. This pipe network consists of diameters ranging from 16 to 45 inches and the operating parameters are based on survey drawings dating back to the 1930s, whose accuracy is highly questionable. Temperatures exceed 300 degrees fahrenheit, and the steam is travelling at over 100 miles per hour. The robot will have to be able to propel itself, and navigate through this pipeline, locate faults, grind out the existing metal and then reweld a perfect seam in these conditions. Under the direction of Honeycomb chairman Steve Gorevan, Chief Electrical Engineering Designer, Sase Sigh, Tom Myrick (Chief Mechanical Designer) and Roopnatune (Systems Engineer) have to develop a concept and build a machine that can not only withstand the hostile subterranean environment, but also perform precise operations by remote control. This documentary follows the process, as the team struggles with the many challenges they face building a new technology from scratch, and the very real possibility that it may not work. The documentary blends together archival material, news footage, and scenes from the lab, where the team discusses many of the problems they face. As failures mount and design hours go way over budget, the topics of conversation range from religion to baseball. An overview of the history of New York's steam system is incorporated, as are predictions and observations about its future. Those interested in the type of development documented here will find it engaging, but I would expect most people would find both the subject matter and the delivery on the dry side, and I would have liked a little more follow-up on the piece than what we get. Stylistically, the archival voiceover tends to be somewhat condescending, while the robotic voice, which mocks its human creators, I found fairly annoying. Still, I did learn a lot about a subject I had never been exposed to before, so the educational value is worth a look, and anyone interested in robotics will definitely want to see the intricacies in the design and fabrication of this machine. Image Transfer Review: W.I.S.O.R. was shot on digital video, and as such has its own look, which tends to be high contrast at times, and gets jaggies when still framed. The lab photography is primarily black and white, with exterior video footage in color, which tends to look edge enhanced and often off color, though this could be intentional. Archival footage looks old, though it is interesting to see how much was actually documented. Audio Transfer Review: Like the video, audio is of mixed quality. Narrative voiceovers are intercut with the location audio, including a pseudo-robotic one, which I didn't particularly care for. There is expected location noise, and some distortion here and there, but the audio serves its purpose. The principle extra is a 13m:25s interview with MIT professor and "father of Artificial Intelligence," Marvin Minsky. He provides many thought provoking ideas about the state of human evolution, politics, religion and the future of mankind. His observations are fascinating, though his views may not make him many friends outside th acedemia or scientifically supportive circles. Also included is a two screen biography on the director, and a single screen with two shots of the finished robot. The theatrical trailer for Negroponte's film Jupiter's Wife is included, as are trailers for other Docurama video releases Regret To Inform, Dancemaker, Bob Dylan: Don't Look Back, Fastpitch, and Nadia Salerno-Sonnenberg's Speaking In Strings, all of which are located in a catalog section which includes overviews on even more titles. Those with an interest in modern robotics will find this worth a watch, though the presentation is not especially dramatic, and maintains a fairly even tone throughout. I was not enthralled by some of the stylistic choices made, especially the robotic voiceover, but did find the program educational. The supplementary interview is also worthy of inclusion, with some perhaps unpopular, though educated views on civilization. Michel Negroponte does an admiral job trying to keep the subject interesting, but I would suspect this will appeal to limited audiences.